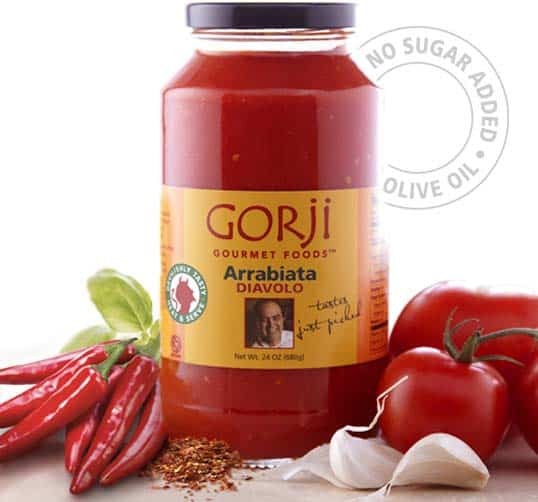 Gorji Gourmet Arrabiata sauce for those who like it spicy! Zestful penne arrabiata sauce, a spicy tomato sauce for pasta, pizza, shrimp, lobster, mussels, a snappy zing on burgers and wherever the devil makes you do it! It has a kick, but it doesn’t linger. Clean tasting with a kick, but it doesn’t linger. Harmony between vine-ripened tomatoes, fresh garlic, cayenne and crushed red pepper creates a clean taste that leaves you wanting. Gorji adds shrimp to classic penne arrabiata. In another recipe he tops Three Cheese Spinach Lasagna with chili with it for extra zing. D Magazine mentioned it with the Eggplant appetizer during their restaurant visit. He also makes a surprising spicy flavor combination of TX chili over a grilled chilled avocado topped with a dollop of yogurt and has even made bloody marys with the spicy tomato sauce. Heat Gorji Gourmet Arrabiata Sauce and combine with your own creations. Gorji Gourmet tastes like you have spent hours preparing it, but only takes minutes to heat and combine with your own creations. Bring a gourmet taste and spicy zing to your favorite dishes. For many more ideas and ways to create with arrabiata sauce using seafood, chicken and pasta see https://www.pinterest.com/explore/arrabbiata-recipes/. • 24 oz. glass jar. Gorji Gourmet Arrabiata Diavolo spicy pasta sauce has won 4 gold food awards and a silver for best new product at ZestFest in 2015. All in blind taste test competitions. It won its first coveted Golden Chile Award at ZestFest in 2015. An additional Golden Chile was won every year since then in 2016 and 2017. And it took home a Gold Award at the Scovie Award Competitions for 2017, bringing the total to 4 gold awards. Chef Gorji adds shrimp to classic penne arrabiata. In another recipe he tops Three Cheese Spinach Lasagna with chili with it for extra zing. D Magazine mentioned it with the Eggplant appetizer during their restaurant visit. He also makes a surprising spicy flavor combination of TX chili over a grilled chilled avocado topped with a dollop of yogurt and has even made bloody marys with the spicy tomato sauce.